The company says the panels feature an impact-resistant acrylic lens designed to achieve a wide light distribution pattern with exceptional color quality in attractive architectural frames. The panels also have a wet-location rating that make them a perfect option for hotel and hospital bathroom showers. With a 50,000-hour rated life, the lights operate on standard 120-volt AC current, and are compatible with standard incandescent dimmer controls, providing even dimming from between 5 and 100 percent. The panels are available in 5.5-, 7- and 9-inch square and round designs ranging from in 11, 14, and 17 watts, producing 700, 900 and 1,200 lumens. There are models with 3,000-degree-Kelvin (cool white) and 4,000-Kelvin (daylight), and have a color rendering accuracy index of more than 90. The EarthTronics Mini Panel LEDs install easily on 4-inch J-boxes with a unique locking design. The 5.5- and 7-inch fixtures also can be used as a retrofit for 4- and 6-inch downlight recessed fixtures with easy-to-install clips to provide a fresh look to old recessed lighting. For more information about the EarthTronics products, visit www.earthtronics.com. 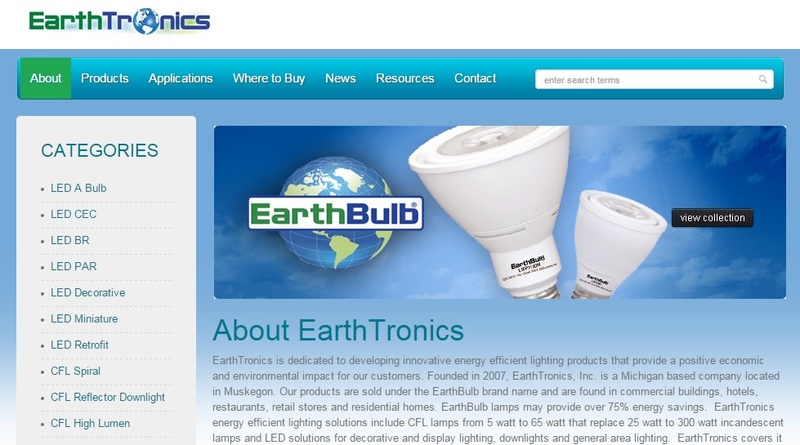 Founded in 2007, EarthTronics is based in Muskegon. Its products are sold under the EarthBulb brand name and are found in commercial buildings, hotels, restaurants, retail stores and residential homes.